Construction projects: More aggressive rollout and implementation? Newsflow has been quite slow in 1H2010, maybe due to govt's intention to announce all these projects one shot in 10MP or they really need to control the government coffers. Possible contracts include LRT extension, MRT (recently announced), possible revival of the high speed rail from KL to Singapore, Pahang Selangor Water Transfer project, SCORE (Sarawak). Possible beneficiaries: IJM, Gamuda, Sunway, Mudajaya, IJM, Loh & Loh, CMSB, WCT, Naim, HSL. Fiscal Consolidation: GST and subsidy removal - Government should bite the bullet and implement these measures to strengthen the fiscal position of the government as the tax base is too narrowed on oil revenue while subsidies are spoiling the industries and cap industries from moving up the value chain. Basically, with the current subsidies on oil, flour, sugar etc, we're actually the Santa Claus of the whole region, subsidizing Singapore, Thailand, Indonesia as people smuggle our cheap goods out of the country. Listing of GLCs - Petronas two subsidiaries (potentially Petronas Carigali and Malaysia LNG) and MOF's subsidiaries (Percetakan Nasional Bhd, Ninebio, Inno Biologics Composites Technology Research Malaysia). More participation of the public in the GLCs which could instill greater transparency, efficiency of the businesses. More divestments of GLC shares? More GLCs following Pos Malaysia's shares divestment by Khazanah? Companies held by Malaysia investment arm include Axiata, Telekom, Proton, MAS, UEM, MAHB, Tenaga, PLUS, Time Engineering etc. Liberalization of economic policies: Hopefully more licenses could be granted to foreign parties to allow more foreign participation in the banking industry and capital markets. More private-sector led economic growth: The private sector needs to take the lead in growing the economy with the support of the government. In 9MP, RM230 billion development expenditure was all funded by the government. 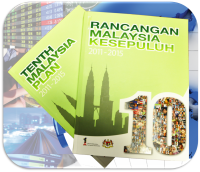 Nonetheless, in 10MP, Government will only fund RM180 billion with RM15 billion being the funds for PFI (Private Finance Initiatives) to allow greater participation of the private sector in development projects. Najib will be focusing on SMEs by granting greater incentives for SMEs which are innovative and are moving up the value chain or at the high value-added industries. This is in line with the government's intention to move Malaysia into a higher level economy. Concerns: All can be great with words only but implementation is still the key. The government should not fear the political backlash and should implement policies which could hurt in the short term but are actually beneficial in the long term e.g. GST, subsidies removal. These measures should be implemented as early as possible but at gradual pace to allow the industries and people to adjust to the new economic reality of high commodity price environment, deteriorating fiscal position and the middle income trap.